What Day Of The Week Was April 14? 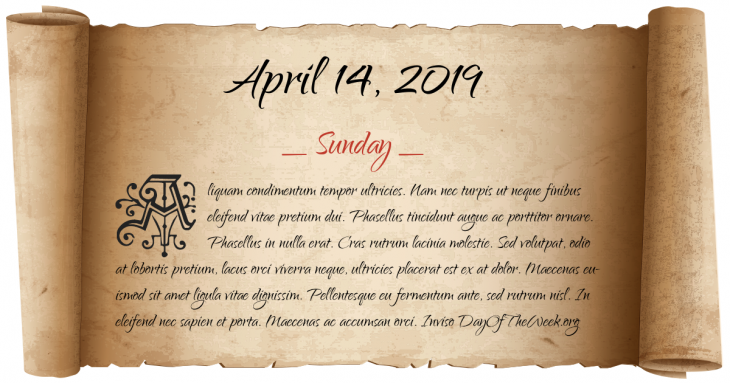 April 14, 2019 was the 104th day of the year 2019 in the Gregorian calendar. There were 261 days remaining until the end of the year. The day of the week was Sunday. Battle of Forum Gallorum: Mark Antony, besieging Julius Caesar’s assassin Decimus Junius Brutus Albinus in Mutina, defeats the forces of the consul Pansa, who is wounded. Siege of Jerusalem: Titus, son of emperor Vespasian, surrounds the Jewish capital, with four Roman legions. Khalsa: The Sikh Religion was formalised as the Khalsa - the brotherhood of Warrior-Saints - by Guru Gobind Singh in Northern India, in accordance with the Nanakshahi calendar. The Soviet satellite Sputnik 2 falls from orbit after a mission duration of 162 days. Gnassingbé Eyadéma overthrows President of Togo Nicolas Grunitzky and installs himself as the new president, a title he would hold for the next 38 years. Nearly 2,700 are killed in a magnitude 6.9 earthquake in Yushu, Qinghai, China. Who were born on April 14?